Grade 6063 structural aluminum pipe is ideal for handrails, displays, and architectural uses. Excellent corrosion resistance provides great durability both indoors and outdoors. What does the "mill finish" look like? Mill finished pipe is raw, unfinished aluminum. Mill finish pipe serves as a great base for painting, powdercoating, and anodizing; but can be left as-is too (designer's tip: it's a great way to create that "industrial look"). Most Nurail projects do not require specialty finishes, as aluminum itself is a very resillient metal for railings, displays and other architectural uses. For very wet, salt, or mechanically abusve environments, please contact us for recommendations. Can I order a sample piece? Yes! We offer a 3/4in x 10in sample piece for only $1. Click here to order your sample piece. Nurail.com offers custom fabrication (custom-cut lengths), pipe finishing (such as anodizing and powdercoating), and alternative pipe material (such as stainless, galvanized and black steel) upon request. Please contact us for an estimate on custom pipe options. 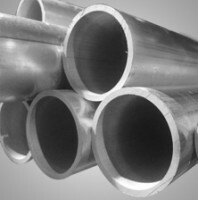 * Note that some restrictions apply to custom pipe orders, including a minimum order of 20ft and non-returnable status.